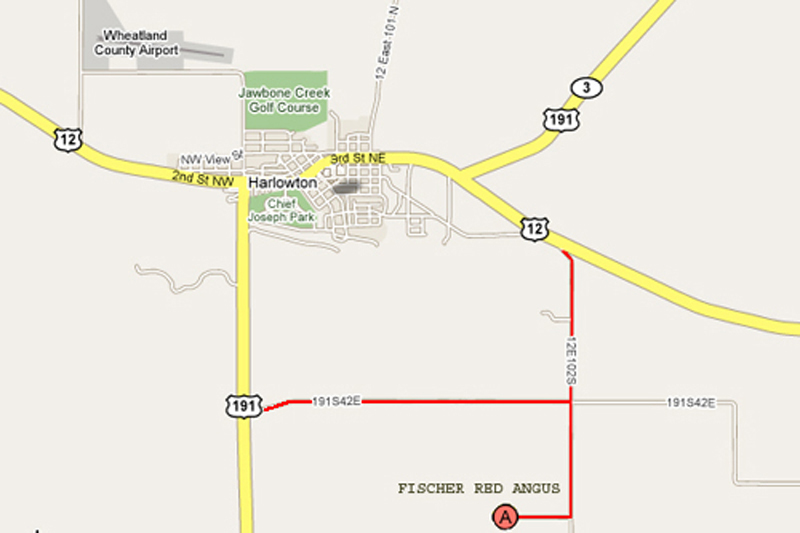 Fischer Red Angus is located 3 miles southeast of Harlowton, MT. Enter Harlo from NORTH - When you make the final bend you'll be able to see a couple of business's in front of you as you make your way down the hill. Make a left turn at the intersection onto HWY 12 as if you're heading to Billings. Go past Ray's, and also go past the next turn to your right which heads back into Harlo. Past Ray's a short distance you make a right turn onto a county road to begin heading down to the river bottom. Follow this county road past the Musselshell River and you will reach a county road intersection ("Four Corners"). Continue going straight through this intersection. Enter Harlo from EAST - Entering from this direction you'll have to keep an eye out for landmarks to find the correct turnoff. You will make a left turn off of HWY 12 onto a county road. When approaching you will see a black weigh station sign on your right, then a small power station on your left. The turn is immediately following the power station. The county road begins heading down to the river bottom. Follow this county road past the Musselshell River and you will reach a county road intersection ("Four Corners"). Continue going straight through this intersection. Enter Harlo from SOUTH - Roughly a mile south of Harlo you'll begin to climb a hill where once on top you'll be able to see the town of Harlo for the first time. The turnoff to begin heading to the ranch is the next available county road on your right. If you begin heading down a hill towards the river you've gone to far, but just jump to as if you're entering from the West. When you make the turnoff you will go straight for a couple of miles until you reach a county road intersection ("Four Corners"). Take a right at the intersection. Enter Harlo from WEST - Entering from this direction you will need to pass all the way through the small town of Harlowton. Go past Ray's, and also go past the next turn to your right which heads back into Harlo. Past Ray's a short distance you make a right turn onto a county road to begin heading down to the river bottom. Follow this county road past the Musselshell River and you will reach a county road intersection ("Four Corners"). Continue going straight through this intersection. At Four Corners - When you make it here take note that the land now to your right is the beginning of our ranch. Head straight for another couple of miles until you see the ranch sign on your right. Turn right at the sign and the road leads you up to the ranch headquarters.